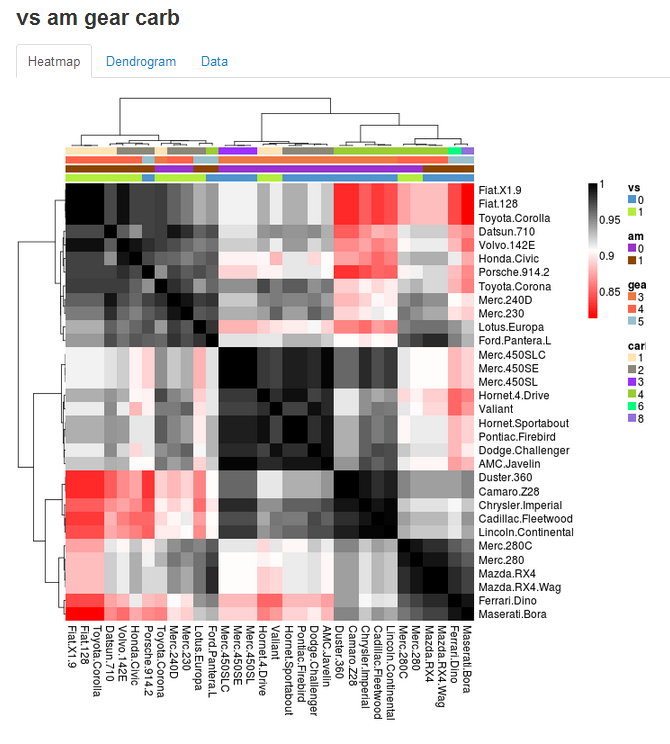 Heatmaps are a great way to visualize data matrices. Heatmap color and organization can be used to encode information about the data and metadata to help learn about the data at hand. An example of this could be looking at the raw data or hierarchically clustering samples and variables based on their similarity or differences. There are a variety packages and functions in R for creating heatmaps, including heatmap.2. I find pheatmap particularly useful for the relative ease in annotating the top of the heat map using an arbitrary number of items (the legend needs to be controlled for best effect, not implemented). Heatmaps are also fun to use to interact with data! 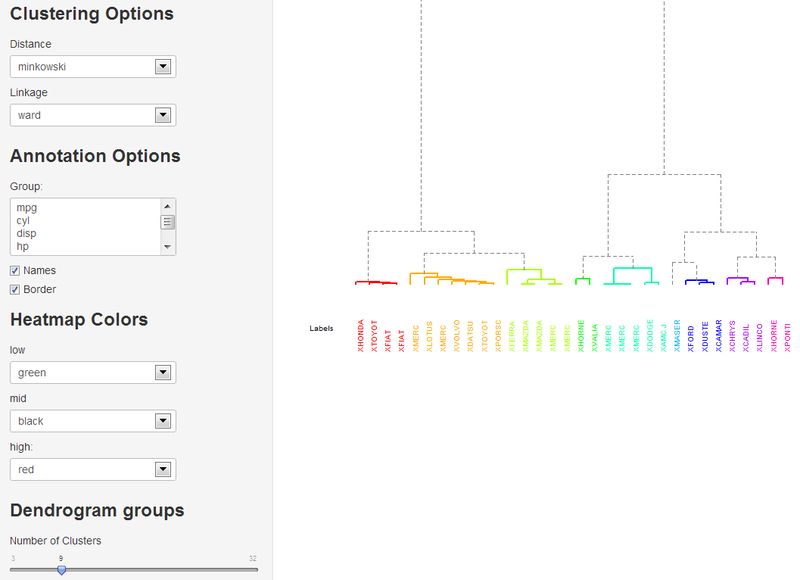 Here is an example of a Heatmap and Dendrogram Visualizer built using the Shiny framework (and link to the code). To run locally use the following code. It was interesting to debug this app using the variety of data sets available in the R datasets package (limiting options to data.frames). 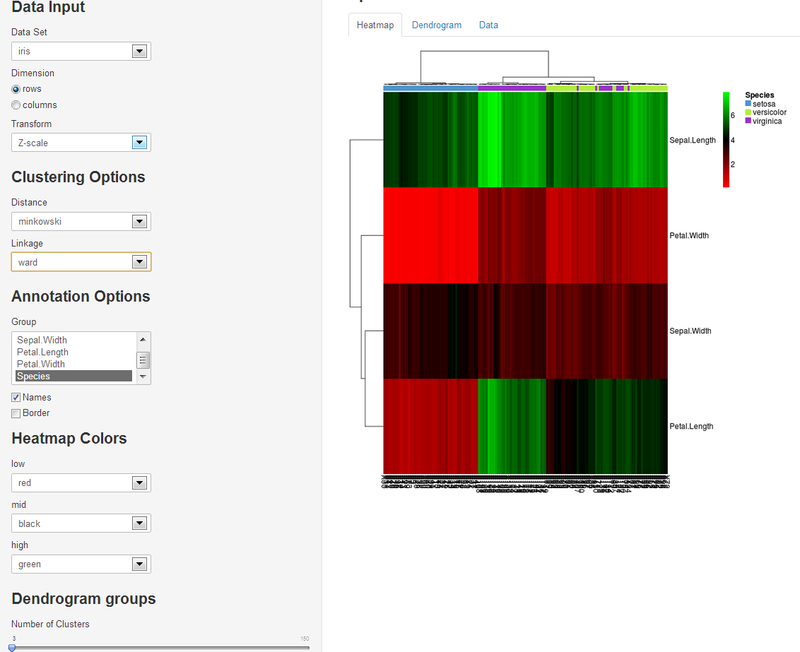 There are a few other options like changing heatmap color scales, adding borders or names that you can experiment with. I’ve preloaded many famous data sets found in the R data sets package a few of my favorites are iris and mtcars. There are other datsets some of which were useful for incorporating into the build to facilitate debugging and testing. The aspect of dimension switching was probably the most difficult to keep straight (never mind legends, these may be hardest of all). What are left are informative (I hope) errors, usually coming from stats and data dimension mismatches. Try taking a look at the data structure on the “Data” tab or switching UI options for: Data, Dimension or Transformation until issues resolve. A final note before mentioning a few points about working with Shiny, missing data is set to zero and factors are omitted when making the internal heatmap but allowed in top row annotations. This was my third try at building web/R/applications using Shiny. It has definitely gotten easier building UIs and deploying them to the web using the excellent Rstudio and Shiny tools. Unfortunately this leaves me more time to be confused by “server side” issues. Over all two thumbs up. This entry was posted on July 7, 2013 by dgrapov. It was filed under Uncategorized and was tagged with arbitrary number, column space, data relationships, dendrogram, Devium, heatmap, hierarchical clustering, pheatmap, R, r-bloggers, shiny. This is really good post, I would need you help in browsing the data and then using the data for forecasting through shiny. Hi, looks like the visualizer has been taken down or moved. Any chance you could update its new location? I would really like to learn to do this. This app is now bundled inside of DeviumWeb (https://github.com/dgrapov/DeviumWeb).